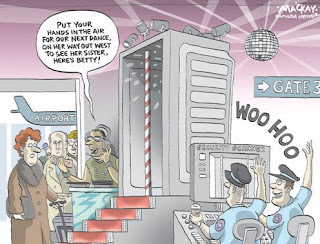 When we ran this feature last week, the issue of airport security was the big news story. Guess what? It's still making headlines, not to mention the subject of editorial cartoons. Enjoy. You can tell U.S. airport security is run by the federal government when a guy with a bomb is allowed on a plane, but officials say they were going to question him in Detroit (after his arrival). Give me a break. 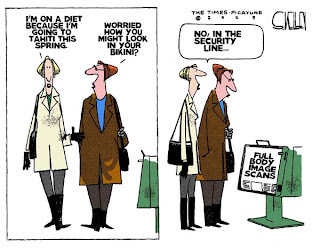 The full body scanner makes it just too easy for the cartoonists! Hope the rest of your Sunday is funny! That's so funny. Great post, made me smile. This is great! Thanks for the kackles this morning!! Don: Your tax dollar at work! CL: Indeed. This stuff's been running for 2 weeks now. That would so be me! 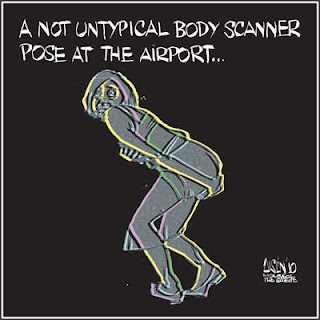 The new body scanner pose. 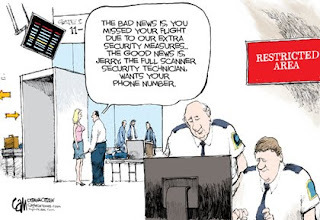 Well I guess they won't be able to call them the friendly skies anymore! It'll be the traumatic and self humiliating airways to a mental break down! Vicky: Glad you enjoyed the cartoons. 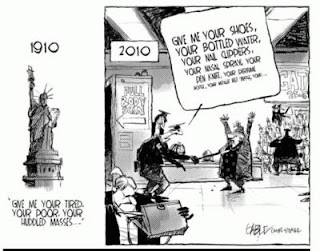 Editorial cartoonists have a way without words. Quirks: Yeah, fly the neurotic skies. Quirks: Freak Smack said he had trouble getting past the word veri yesterday so I dropped it for now. We'll see how long this lasts without me getting spammed. Try Disques. It's really great for being able to reply to people. 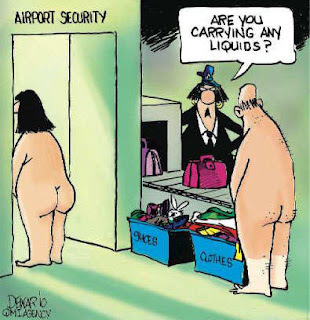 Love the funnies. Someday government will actually work and then we'll have nothing to laugh at... Nah! jayne: Did you say one day government will actually work? Hah!